The Parched Pig quietly opened their doors early January to a full house of those who had been eagerly waiting. 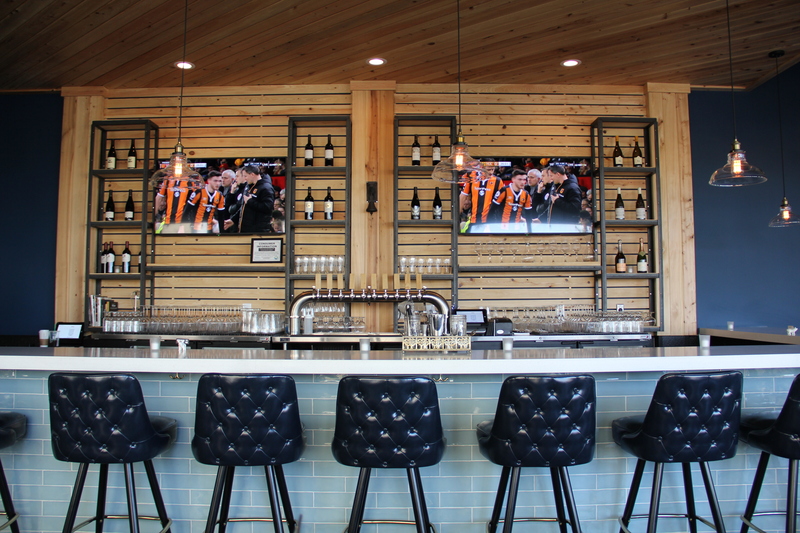 Dubbed a “Tim Lipman Watering Hole,” the newest addition to the Donald Ross corridor features a lengthy, house-curated menu of craft beers and global wines from which to choose along with a handful of small plates. The space was previously home to Vault 39 but has been transformed with an open concept design and freshly built bar and kitchen. The finished product is cool and inviting with glass tile accents, navy tufted leather barstools, a wood slat wall featuring flat screen TVs, rustic seating and Georgia pine tables. The name “The Parched Pig” pays homage to Coolinary Cafe, Lipman’s maiden endeavor and ever-popular restaurant located within the same plaza. Those who have visited Tim’s eatery may have noticed the many pigs displayed throughout the space. Their Rob Evans-designed logo features a pig, a nod to farm life, which inspired patrons to bring swine paraphernalia from all over the world to display. The Lipmans embraced their customers’ sentiment and decided that this hog was feeling particularly thirsty. Once the space had a name it began to have an identity, which turned into to a design, a menu and an effortless synergy with its sister restaurant. 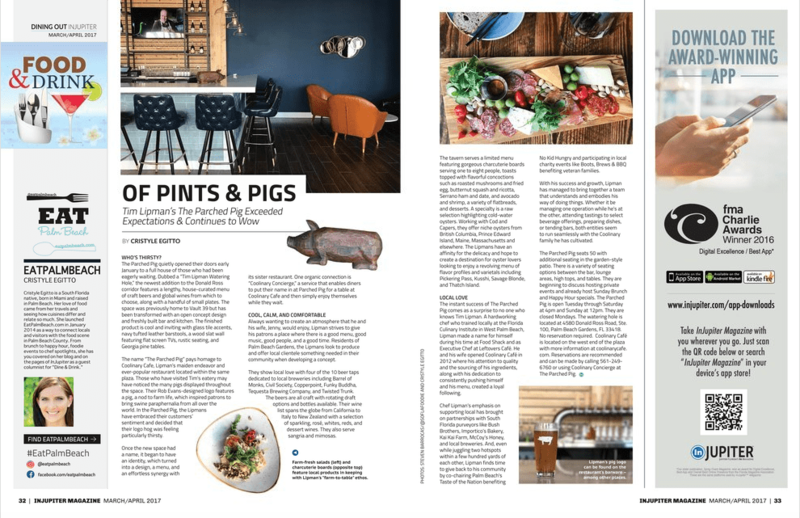 One organic connection is “Coolinary Concierge,” a service that enables diners to put their name in at Parched Pig for a table at Coolinary Cafe and then simply enjoy themselves while they wait. Always wanting to create an atmosphere that he and his wife would enjoy, Lipman strives to give his patrons a place where there is a good menu, good music, good people and a good time. Residents of Palm Beach Gardens, the Lipmans look to produce and offer local clientele something needed in their community when developing a concept. They show local love with four of the ten beer taps dedicated to local breweries like Barrel of Monks, Civil Society, Copperpoint, Funky Buddha, Tequesta Brewing Company and Twisted Trunk. The beers are all craft with rotating draft options and bottles available. Their wine list spans the globe from California to Italy to New Zealand with a selection of sparkling, rosé, whites, reds and dessert wines. The tavern serves a limited menu featuring gorgeous charcuterie boards serving one to eight people, toasts topped with flavorful concoctions like roasted mushrooms and fried egg, butternut squash and ricotta, Serrano ham and date and avocado and shrimp, a variety of flatbreads, desserts and a raw selection highlighting cold water oysters. Working with Cod and Capers, they offer niche oysters from British Columbia, Prince Edward Island, Maine, Massachusetts and elsewhere. The Lipmans have an affinity for the delicacy and hope to create a destination for oyster lovers looking to enjoy a revolving menu of flavor profiles and varietals including Pickering Pass, Kusshi, Savage Blonde, and Thatch Island. The instant success of The Parched Pig comes as a surprise to no one who knows Tim Lipman. A hardworking chef who trained locally at the Florida Culinary Institute in West Palm Beach, Lipman made a name for himself during his time at Food Shack and as Executive Chef at Leftovers Café. He and his wife, Jenny, opened Coolinary Café in 2012 where his attention to quality and the sourcing of his ingredients along with his dedication to consistently pushing himself and his menu created a loyal following. Chef Lipman’s emphasis on supporting local has brought on partnerships with South Florida purveyors like Bush Brothers, Importico’s Bakery, Kai Kai Farm McCoy’s Honey and local breweries. And, even while juggling two hotspots within a few hundred yards of each other, Lipman finds time to give back to his community by co-chairing Palm Beach’s Taste of the Nation benefitting No Kid Hungry and participating in local charity events like Boots, Brews & BBQ benefitting veteran families. With his success and growth, Lipman has managed to bring together a team that understands and embodies his way of doing things. Whether it be managing one operation while he’s at the other, attending tastings to select beverage offerings, preparing dishes or tending bars, both entities seem to run seamlessly with the Coolinary family he has cultivated. The Parched Pig seats fifty with additional seating in the garden-style patio. There is a variety of seating options between the bar, lounge areas, high tops and tables. They are beginning to discuss private events and host Sunday Brunch and Happy Hour specials. The Parched Pig is open Tuesday through Saturday at 4pm and Sunday at 12pm. They are closed Mondays. The watering hole is located at 4580 Donald Ross Road, Ste. 100, Palm Beach Gardens, FL 33418. No reservation required. Coolinary Café is located on the West end with more information at coolinarycafe.com. Reservations are recommended and can be made by calling 561-249-6760 or using Coolinary Concierge at The Parched Pig.